Much of the state with the exception of Southeast PA experienced severe thunderstorms Monday. Many people are cleaning up from the abundant wind damage caused by the storms. One homeowner in Huntingdon had a close call when a large tree in his front yard came crashing down. Another system plans to move through the area late this week. Rain will move into the state Thursday Afternoon and persist through the day on Friday, before ending in most locations Friday Night. Rainfall will range from just a half inch in some areas to over 2″ in others. View expected amounts below. Area A – Rainfall amounts will range from 1.5 – 2+” in this region. Scattered flooding possible in areas that received heavy rain with the storms Monday. Area B – Rainfall amounts will range from 1 – 1.5″ in this region. Isolated flooding possible in areas that received heavy rain with the storms Monday. Area C – Rainfall amounts will range from .5 – 1″ in this region. Download our new, free app today! Much colder weather will follow this system. In fact some areas will see SNOW showers early next week. Yes, snow snow showers in the second week of May. We don’t expect any real impacts. View the map below. APRIL SHOWERS BRING MAY…SNOW SHOWERS? Area A – Snow showers Sunday to Tuesday expected. A coating of snow on grass and cars possible Sunday Night. 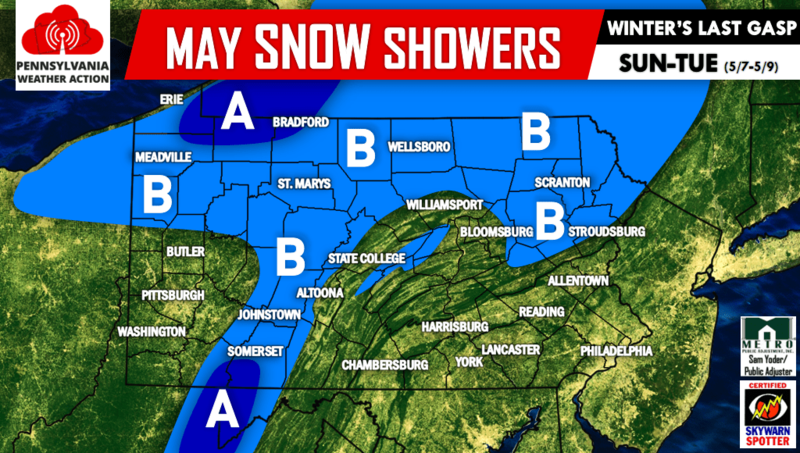 Area B – A few snow showers Sunday – Tuesday. We will be entering a colder pattern that will likely last for much of the month. If you don’t see the snow, you will definitely feel the temperatures. 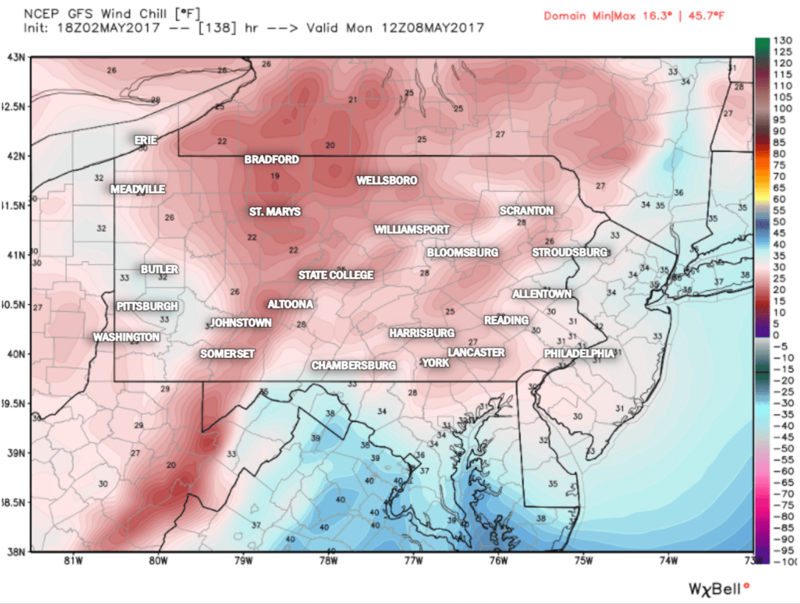 Take a look at wind chills Monday Morning (5/8). We know, nothing like freezing as you walk out the door on a May Morning. For more updates like this one, be sure to like us on facebook >>> Click Here to Like PA Weather Action on Facebook! Share this crazy weather with your friends and family using the icons below!